SpecialEffect is a charity that targets something which often gets overlooked – people with physical disabilities have lives beyond simply ‘being disabled’ and want to enjoy themselves. We provide the specialist technology, advice and support for everyone to benefit from the fun, friendship and inclusion of video games, leisure technology and communication. We know there’s no one-size-fits-all way of doing this. So we visit people to find out exactly what they want to play, and what they need to play it. We’ll then match, modify or create equipment to lend to them, and give support so they can get the best out of it. 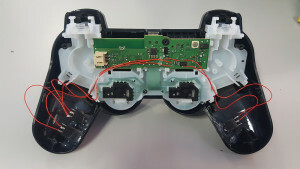 One of the many ways that we might do this is through custom modifications of controllers. This modded controller is for one of our friends Ryan. His muscular dystrophy means he has hardly any movement in his fingers, so he can’t use a standard controller. 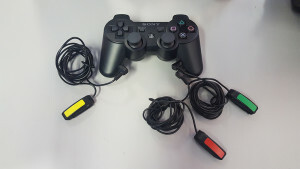 He’d like to be able to play FIFA on the PS3, so our team worked with him and found some small but controllable movements in his hands and body. He had small movements in one of his fingers, but they were too weak to operate a standard stick. 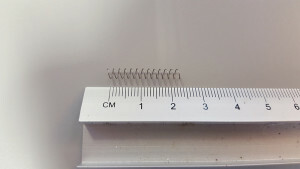 Our plan was to replace the tiny spring within the body of the stick itself so it would take less effort to move. We also discovered that Ryan could operate three lightweight accessibility switches – one with his foot and two with his hands. 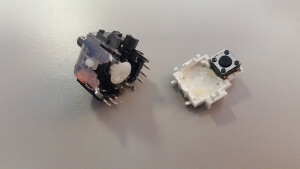 By further modding the controller, these switches could be used to replace the Start, Cross and Circle buttons. 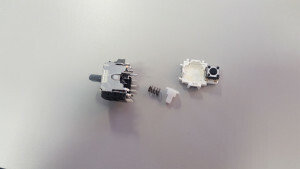 So we set about cannibalising the PS3 controller to replace the springs and add sockets for the three switches. 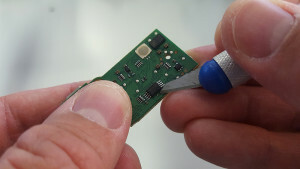 First we removed the screws and the rear, then the PCB. 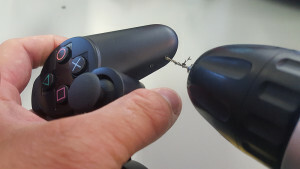 Then we unclipped the inner section of the controller. Time to remove the rumble functions to make room for the jack sockets in the handgrips. 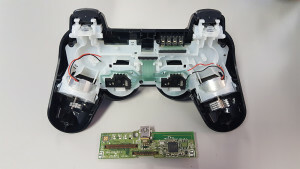 Next we removed the left analog stick (the one Ryan needs to be made lighter) and eased back the securing tags of the metal casing to open it up. 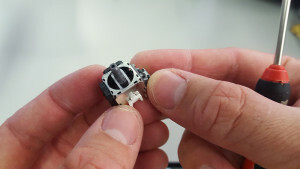 We then swapped a lighter gauge spring into the analog stick, and reassembled it. On to the switch sockets. 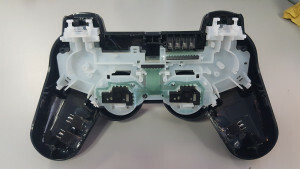 With this type the PS3 controller the contacts under each button are located on a sheet of plastic. 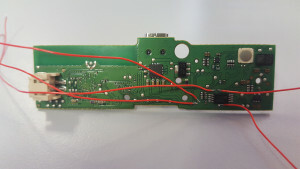 So we traced these contacts back to the front of the PCB and found the tracks that we wanted to solder onto. We removed the protective layer covering the tracks. Great care was taken at this point to not scratch away any area outside the track or this could cause issues later on. 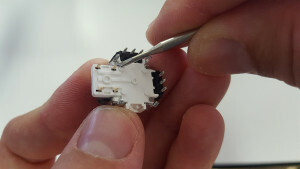 We then soldered light gauge single core connection wire to these points. …reinstalled the PCB and soldered the wires to the sockets. 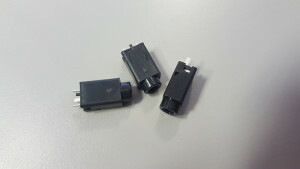 Then we replaced the cover, and tested the sockets with the lightweight switches. 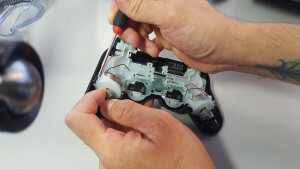 The modifications that we do are part of our service that we offer to people with disabilities who would like to enjoy video games. Our teams consist of technologists, games experts, and occupational therapists who work closely and intensively with the people we help, identifying abilities and movements they have that can be used to help or in place of a button press or stick movement. In Ryan’s case, as with many people who have progressive conditions, we’ll be there to offer help again if his abilities change and he wants to carry on gaming. We don’t charge for any of our help.